April 2012 – Chicks With Sticks – Article – Palm Springs Life Magazine April issue. The article features interviews with Kim Kelly and Roxy Keyfauver, Playing Members of Empire Polo Club. March 3rd, 2012 – Debii $$ Conant Women’s Memorial Polo Tournament coverage on KESQ Channel 3. Greg Lee interviews Alex Haagen, IV, Sunny Hale and Lynn Cobb about the Women’s Tournament and Women’s Polo at Empire Polo Club. February 14th, 2012 – Quarantine Lifted, Polo Back On Ind Indio. KESQ Channel 3. Coverage on live news and online. February 4th , 2012 – Four Legged Fun In Indio. by Susan Cohn/The Daily Journal San Mateo, CA. 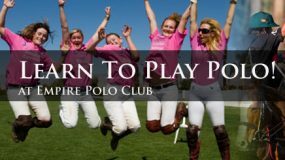 The article talks about the sport of polo and how to get started playing at Empire Polo Club, Indio, CA. 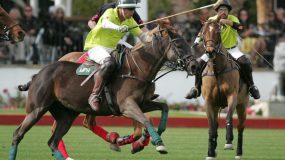 February, 2012: Flying Hooves: The ancient sport of polo, long regarded as the “Game of Kings,” is played with keen ferocity in the desert. Desert Magazine/ Feb. Issue, Page. 85-88. Features interviews with Rob Scapa, Jef Graham and Rick Paicius, Members of Empire Polo Club. January 29th, 2012: Channel 2 KPSP News coverage of the inaugural Empire Polo & Wine Festival. January 27th, 2012 – Temporary Loss of Polo Hits Local Businesses by Bianca Rae, Channel 3 KESQ. January 27th, 2012: Alex Haagen IV, Interview on the Lee Rayburn Show KNEWS 94.3. Lee Rayburn Show Hour 2 Friday 01/27/12 Hour 2. January 23rd, 2012: Indio looks to revamp image with new slogan, logo. Polo & Wine Festival & Concerts featured as part of new logo. Desert Sun Newspaper. January 19th, 2012: Empire Polo & Wine Festival article in Desert Star Weekly. January 8th, 2012: Greg Lee of KESQ, Channel 3 covers Opening Day at Empire Polo Club. Interviews with Mr. Haagen and 11 year-old Conrad Kissling. January 7th, 2012: Greg Lee of KESQ, Channel 3 Interviews Empire’s Alex Haagen IV, Rob Scapa and Ashton Wolf about Sunday Polo & Opening Day. January 2012: Empire Polo is featured in the Desert Guide Calendar as the featured event with season highlights. Desert Guide January Issue/Palm Springs Life. January 5th, 2012: The Morning Show, KPSP Channel 2 is shot live at Empire Polo. Kate Cagle takes a polo lesson with Kevin Ittig of Empire Polo Club. January 3rd, 2012: Eye on the Desert, KPSP Channel 2 – Scott Hennessee interviews Kevin Ittig about polo at Empire and Opening Day. 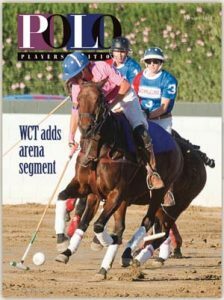 January 2012: Polo & Wine Article – Palm Springs Life Magazine ONLINE. Nov. 11th, 2011: It’s Polo, People! Palm Springs Life article about Empire Polo Club.